This week we've got a slick new dashboard just for you. It has a brand new, collapsible, sidebar that makes getting around a breeze. Just like the old dashboard, you can watch the action unfold in real time with All updates or check out the pages with lots of activity and buzz in the Popular feed. Last but not least, we've made a place for those spaces that you hop in and out of several times a day. Hit the star icon in a space's sidebar or in the space directory to make it appear in the sidebar. Give your site some personality by adding useful announcements, links or a happy, shiny photo from your last team outing. The the whole right hand column is ready and waiting for you to customize. If you're a Confluence administrator you'll be able to edit the content right from the dashboard. No more having to spot the same typo twice! Confluence will now keep you in the same spot when you move between editing and viewing a page. Less scroll, more win. Also, to give you a cleaner reading experience, page data (breadcrumbs, labels, and restrictions) and tools now auto-hide when you scroll down the page. They reappear again as soon as you start to scroll up, so they're just as easy to get to when you need them. We've made some small changes to the restrictions dialog to make it easier to see who can view a page when editing is restricted. You'll now see 'Everyone' listed, which shows that all people who can see the space will be able to see the page. The content by label and page properties report macros have already had a touch of CQL (Confluence Query Language) goodness. Well, we're now bringing that goodness to search. 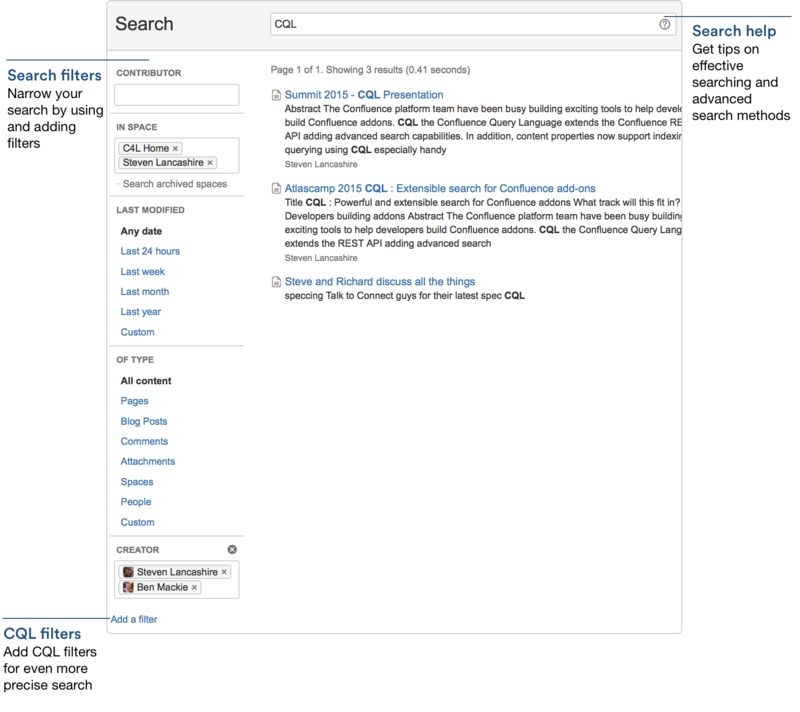 When you do a full search in Confluence, you can now add CQL filters – like label, mentioning user, with parent, and more – to really refine your search. Need to find a page that mentioned you? Which was called 'workshop something something...'? Which was created this week? Just search, hit Add a filter and add as many filters as you need to, to get the right results. If you use JIRA Service Desk, you can now allow all active users and customers to view knowledge base articles in Confluence without granting them a Confluence license or enabling anonymous access to your site. This new setting is enabled via JIRA Service Desk, but can be turned off in Confluence at any time (globally or for specific spaces). Like, comment or edit content. See the dashboard, user profiles, the people directory, or the space directory. This feature is available out-of-the-box and requires zero configuration. To begin collecting feedback, log in as a service desk project administrator and proceed to Project administration > Satisfaction settings. 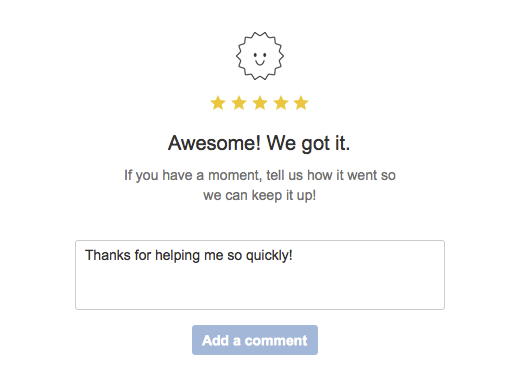 Once you start collecting customer feedback, you can evaluate it using your project's default Satisfaction report. Learn more about this feature here. You can find the full list of JIRA Service Desk Cloud bug fixes and feature improvements here. If you're using JIRA Software for the first time, or you're creating a board from Boards (in header) > View All Boards, your board's name will be automatically based on your project key. But don't worry — you can still rename your board via the 'Board Configuration' screen. One for the developers out there — If you've been using the JIRA Agile REST API to work with boards in JIRA Software, you'll be happy to know that you can now create boards via the REST API. Check out the new 'Create board' method in the REST API documentation, and you'll be whipping up new boards in no time at all. On Monday, 23 November 2015, we are ending support for Windows 2008 and 32bit Amazon Linux images. The images will continue to be available in the upgraded instances, but won't be listed as stock images for new Bamboo Cloud subscribers. The unsupported images won't receive updates and will be treated as custom images. Note: The 32bit variant of Amazon Linux has been abandoned by Amazon in 2014 and no longer receives security fixes. For more information about supported stock images, see stock images. With this release, all stock images in Bamboo will be using Java 8 for the system Java. Note: This change shouldn't affect your builds.